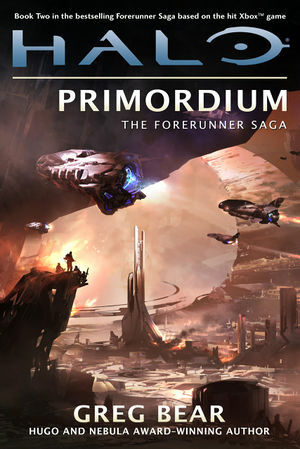 Halo: Primordium is the second novel in The Forerunner Saga by Greg Bear and is the sequel to Halo: Cryptum. It was released on January 3, 2012, with an audio edition released simultaneously. The sequel to the novel, Halo: Silentium, was released on March 19, 2013. Similar to Halo: Cryptum, the story is told as a first-person narrative, from the perspective of Chakas, one of the two humans who accompanied Bornstellar Makes Eternal Lasting during the events of Cryptum. The novel is set primarily on Installation 07, a Halo ring under control of the rampant Mendicant Bias. After crash-landing on the ring during Mendicant Bias' assault on the Capital, Chakas is joined by two local humans, Vinnevra and Gamelpar, in an odyssey to find his companion Riser. As they attempt to survive on the war-torn Halo, they face several obstacles, including the ancient being known as the Primordial, the Flood, and Mendicant Bias. Like the rest of The Forerunner Saga, the novel's story has resonant connections to Halo 4, among them the introduction of the Composer. Primordium' framing narrative of 343 Guilty Spark, the UNSC Rubicon and Spark's search for the Librarian is picked up in the 2019 novel Halo: Renegades taking place three years later. The book begins with an ONI science team interrogating a damaged Forerunner monitor, believed to be a duplicate of a previously encountered device, questioning it about the Didact and the ancient relations between Forerunners and humans. The monitor, revealing that it was once a human named Chakas, then proceeds to tell the story of its origins through a series of flashbacks. Over the course of the story, the monitor breaches the ship's firewall several times, much to the team's dismay. None of the human characters in the present-day segments are identified by name and are only referred to by their titles. At first, the monitor describes his childhood and youth as Chakas, and how he met his companion Riser. He then recounts the events of Halo: Cryptum from Chakas' perspective and explains how the Librarian's geas caused "old spirits", or genetically imprinted personalities of humans who fought in the human-Forerunner wars, to surface within him and Riser. After the Didact, Bornstellar and the two humans are captured by the Master Builder at Janjur Qom, Chakas is separated from the others and is put into stasis. During Mendicant Bias' attack on the Capital, the ship carrying Chakas is destroyed and his escape pod crash-lands on a Halo installation. He is found by a human girl named Vinnevra, who has been sent to the crash site by her grandfather, Gamelpar. It is revealed that the Halo is home to humans of various kinds, who collectively refer to themselves as "the People", and have been transplanted there long ago as part of the Librarian's preservation efforts. However, the Master Builder took control of the ring and began to use the humans in his experiments on the Flood. Many humans were seen to be immune to the Flood, prompting the Master Builder to bring in more humans from Earth in order to retrieve the ancient records stored in their genetic material in hopes of finding the secret to this supposed immunity. After Chakas recovers, he soon finds that he is host to the archived personality of Forthencho, the Lord of Admirals, who commanded the human military forces against the Didact's fleets in the final battle of Charum Hakkor. Vinnevra takes Chakas to see Gamelpar, who explains that he was originally from Earth and, like Chakas, also holds an "old spirit" within him. The old man also explains the history of the humans on the installation, and reveals that he has once been taken to what the humans call the Palace of Pain; a term used by the People for the Flood research facilities on the installation. Chakas, Vinnevra, and Gamelpar then proceed to follow Vinnevra's geas, which they assume will lead them to safety. However, it instead takes them near one of the "Palaces of Pain", where the group witness numerous humans following their geas walking into the structure whilst being observed by the Primordial, supposedly the last Precursor. The three then decide to move in the opposite direction. Coming across the shores of a large lake, the three stumble upon a collapsing human city, in which Gamelpar and Chakas see a proto-Gravemind locked in a Forerunner cell. After crossing the lake, the three are found by a Lifeworker named Genemender Folder of Fortune, several Denisovans, and a large ape. Strangely, Genemender and the humans cast off no smell and the insects are not interested in them. After being fed by Genemender and sent to sleep, Chakas awakens to see Riser, who warns him not to trust the Lifeworker and the other humans. Genemender then takes Chakas to a laboratory and explains what has occurred regarding the history of the Flood, the Halo Array, the devastation of Janjur Qom, and the battle of the Capital. Genemender also explains that the Master Builder's attack on Janjur Qom caused a small civil war to break out among the Forerunners defying the Master Builder, of which Genemender was one. Genemender is eventually forced to reveal that he and the humans in his compound are not actually alive, but archived personalities manifesting as life-like hard light holograms. Genemender, who is actually based within a monitor, is under orders to salvage the humans' genetic records to prevent them from falling into the hands of the Flood and the Master Builder. The monitor wants to do this to Gamelpar, who is dying, but Gamelpar rejects him and has Chakas accompany him in his final moments. Before dying, Gamelpar has Chakas promise to watch over Vinnevra. The systems in the area then power down, leaving Chakas, Riser, Vinnevra, and the ape, whose name is revealed to be Mara by Riser, who can communicate with her, to continue their journey. Riser then tells Chakas how he found them. During the battle over the Forerunner Capital, Riser and the Forerunners that were holding him crashed on Installation 07. One of the Forerunners, who was locked up by the others due to him being on the opposing side of the small civil war caused by the Master Builder, told the others that Riser was valuable due to his geas, and thus the others protected him as they moved out. After a while of traveling over a desert infested with Flood biomass, the group was covered in Flood spores, killing the Forerunners but not Riser, who continued traveling until he stumbled upon Chakas. Chakas and Riser then allow their spirits to converse with one another. This interrupts the monitor's data stream, causing Forthencho to briefly take over Chakas as the narrator. It is revealed the Riser's spirit was a woman named Yprin Yprikushma, another high-ranking human who was responsible for excavating Precursor ruins and moving the Primordial to Charum Hakkor, which Forthencho disapproved of. Forthencho also recounts the events during the humans' war with the Forerunners, the final battle at Charum Hakkor, and their eventual defeat and the extraction of their personalities and memories via something called the Composer. The group is finally found by a transport and they are brought to the lair of Mendicant Bias deep inside the Halo's bowels. Chakas, Riser, and all of the other humans from Earth are gathered and have their imprinted ancestral personalities removed and implanted into monitors. Mendicant Bias promises them revenge on the Forerunners; however, they must first save the Halo from colliding with a planet, due to the ring being on a destructive course as a security measure should it fall under enemy control. The plan is for the Halo to position itself in such a way that the planet will pass through the Halo, which will suffer heavy damage but will survive. As the Halo moves towards the planet, Chakas is connected to the Silent Cartographer in order to interface with the Halo and help coordinate its movements. A fleet led by the Bornstellar Didact then appears, and the Didact uses a failsafe code to disable Mendicant Bias. The Didact then enters the Cartographer and commands that the Halo be saved by moving it to an Ark installation for repairs. To successfully move through a portal, however, the Halo must shed a large portion of its constituent structure, thus reducing its diameter from 30,000 kilometers to 10,000 kilometers. Though heavily damaged, the Halo survives and moves through the portal. Shortly afterward, the Didact brings a mortally wounded Chakas ‌— who is already undergoing conversion into a monitor ‌— with him to confront the Primordial, who has been imprisoned. The ensuing conversation reveals that the Primordial is actually a Gravemind, and that more Precursors may have survived their war with the Forerunners. The Didact claims that war happened because the Precursors resented any who might take up the Mantle, but the Primordial explains that the Forerunners had been deemed unfit for the Mantle. The Primordial asserts that "there is no difference" between the Flood and the Precursors, although it does not reveal the precise nature of their relationship. It also reveals that no human was ever truly immune to the Flood, but the Flood can choose whether to infect or not infect. The Primordial states that the Flood is a test to judge a species' worthiness of inheriting the Mantle, stating that the Forerunners are to be eliminated and that humans will be tested next once they rise again. At the conversation's conclusion, the Didact kills the Primordial by activating a reverse stasis chamber that forces the Primordial to go through a billion years of aging in several seconds, causing it to disintegrate. Back at present day, the ONI researchers reluctantly accept that the monitor telling the story is actually 343 Guilty Spark, the monitor of Installation 04. In the final segment of the story, Guilty Spark briefly explains what happened after he had become a monitor; he reveals that the Ecumene Council was reinstated and the debates on new strategies against the Flood renewed under the direction of the Didact. He also notes that Riser and Vinnevra survived and were relocated on an Ark under the Librarian's care, with Riser eventually being returned to Earth. The book ends with the remains of Guilty Spark's monitor shell being ejected into space after powering down, but not before he injects his data stream into the ship's computer, subdues the shipboard AI and takes control of the ship. He then explains to the crew that he desires to resume his quest to find the Librarian and retrieve the old spirits of Riser and Vinnevra. Asserting that the Librarian is actually alive, he puts the crew to sleep and has the ship proceed to her location. A primordium is an aggregation of cells that is the first stage in the development of an organ or tissue. In the context of the novel, it is a derivation of the term Primordial, which is a title given to the last Precursor. The novel's cover illustration, as well as that of Halo: Cryptum, was created as concept art for Halo 4. Both images were illustrated by Nicolas "Sparth" Bouvier. The novel is dedicated to Claude Errera, a long-time Bungie and Halo fan as well as the founder of halo.bungie.org. A preview of the novel's first chapters was released on December 28, 2011 on Tor.com and Halo Waypoint, with the first chapter released on Tor.com and the second and third chapters as well as part of the fourth chapter on Halo Waypoint. The audio edition of the novel is narrated by Tim Dadabo, the voice actor of 343 Guilty Spark. The fourth Eleventh Hour report, "Provenance", provides additional background for the modern-day portion of the novel. For example, the report identifies the ship of the UNSC science team as UNSC Rubicon and reveals that the damaged monitor shell was recovered during an ONI expedition to the severely damaged Installation 00, implying that the monitor featured in the novel is in fact the damaged remains of the Guilty Spark encountered in the games and not a duplicate discovered elsewhere. The follow-up novel Halo: Renegades reveals that Spark's search for the Librarian was actually to find a personality imprint of her similar to the one on Requiem but this one located beneath Mount Kilimanjaro on Earth. Spark's desire was to access the Domain through the Librarian and have her either bring his friends back as geas or for him to go to the Domain to join them. It is also revealed that the story 343 Guilty Spark told the Rubicon crew was released in a data drop and reached ONI, interesting them with Spark's survival and his search for the Librarian. Text-free version of the novel's cover art. A wallpaper version of the cover illustration.